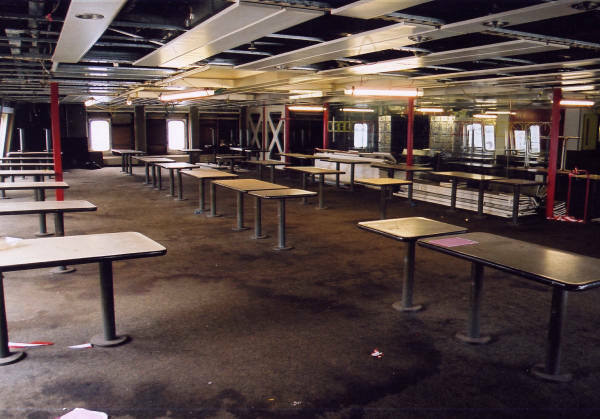 The forward spaces, originally an upper restaurant and lower cafeteria have been retained for the ship's new crew. In the latter, the glass partitions with the clock images on them remain, replicating the Hansen mural which once graced the aft bulkhead of the restaurant above. The latter however has disappeared and the restaurant itself is somewhat more derelict with piles of ceiling panels and much scaffolding in place. DSB children's play equipment (in the form of a large wooden steam railway engine and a 'boat' in the old DSB livery) could be found here, for eventual use by the children of crew members. 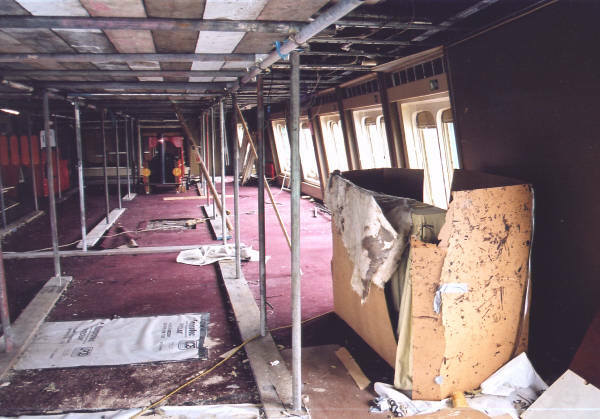 Amidships on one of the upper levels, the Royal/VIP suite has been retained in good condition, although the original furniture has been removed. Down below, the railway deck remains, with the tracks now in-filled as it undergoes conversion into a series of large operating theatres. A small garage area at the stern has been retained for the storage of vehicles and spares etc. At what would have been mezzanine level however, an entirely new deck has been created for the installation of yet more cabins. Beneath the railway deck, cabins lay slightly derelict but otherwise intact. 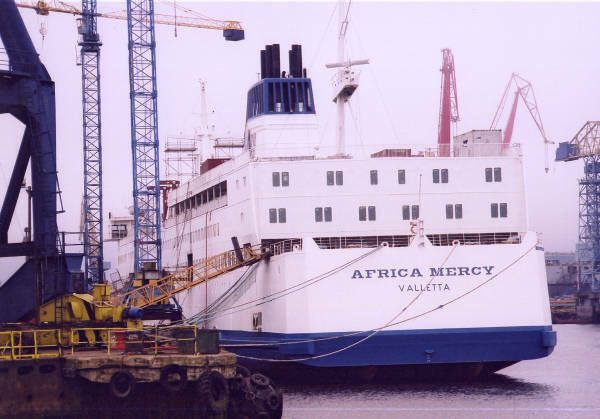 Top: The Africa Mercy from astern. Below: The former cafeteria space does however retain these glass panels with the clock image. 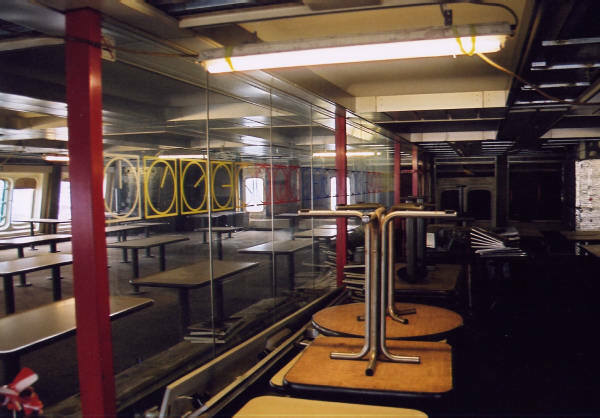 Below: In the cafeteria, the fixed tables remain, but all the seating has been removed, as have many of the ceiling panels to allow maintenance. Below: Upstairs in the restaurant, there is even more dereliction: the ceiling has been completely stripped out and all the furniture removed. 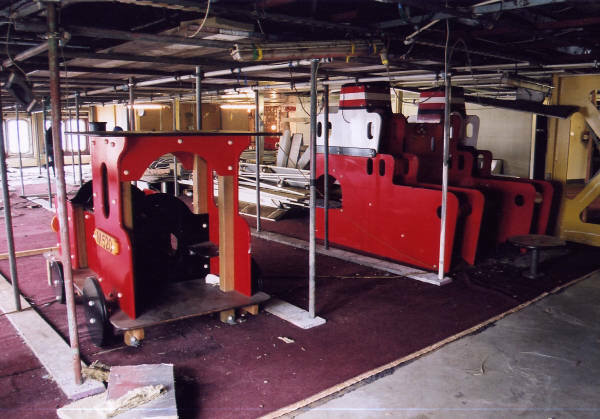 Below: DSB childrens' play equipment in the former restaurant. 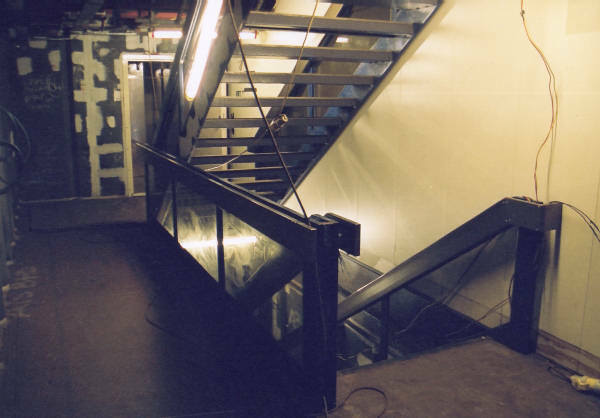 Below: One of the train deck stairwells. 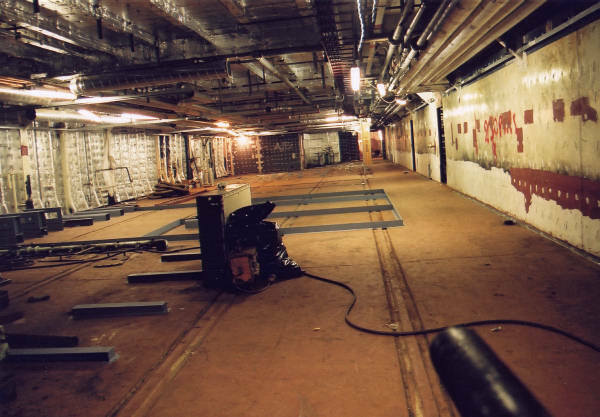 Below: The train deck itself: the railway lines are still visible, but ultimately this area will be one of the new operating theatres.